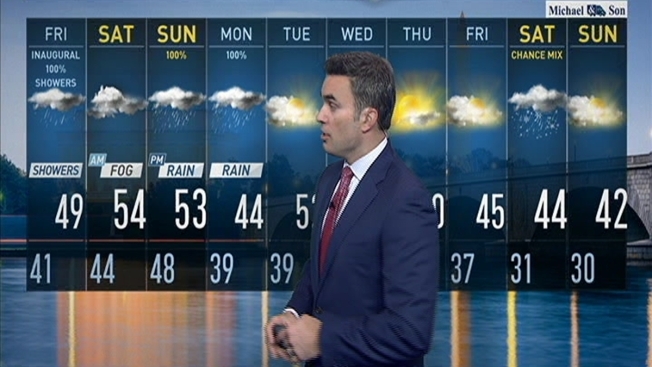 If you're heading to the National Mall on Friday, expect rain and temperatures in the 40s. While Inauguration Day is not expected to be particularly cold, rain showers are likely, Storm Team4 said. Pack a poncho if you'll watch the swearing-in ceremony from a ticketed area; umbrellas will not be allowed, the Joint Congressional Committee on Inaugural Ceremonies said. However, if you plan to stand along the parade route or on the National Mall, you will be allowed to bring a small, collapsible umbrella Friday. The National Park Service announced the change to their previous "no umbrella" policy Thursday. Long umbrellas that cannot collapse will not be allowed on the parade route or the National Mall. Umbrellas may not have pointed tips. Saturday, the day of the Women's March on Washington, is expected to be partly sunny, with rain not expected. Fog is expected to start developing Friday night and continue into Saturday morning. Temperatures will be in the 40s around 10 a.m. for the start of the Women's March and are expected to reach the mid 50s later in the day. The rainiest Inauguration Day on record is President Franklin D. Roosevelt's second inauguration in 1937. Nearly 2 inches of rain fell, with nearly 0.7 inches falling from 11 a.m. to 1 p.m. The temperature was only about 33 degrees, so sleet and freezing rain fell too. An estimated 200,000 people headed to Washington to watch the swearing-in ceremony, but many never got further than Union Station. Roosevelt rode to the White House in an open car. By the time he arrived, a half-inch of water had accumulated inside the vehicle. President Ronald Reagan's first inauguration, in 1981, was the warmest Inauguration Day on record, with a noon temperature of 55 degrees. Reagan's second inauguration, in 1985, was the coldest on record. Temperatures were only about 7 degrees. There was plenty of sunshine, but newly fallen snow and a breeze made it feel more like 10 to 20 below zero! The ceremony was moved into the Capitol, and the parade was canceled. Eight inches of snow fell in the nation's capital the night before President John F. Kennedy took the oath of office. The day was sunny, but temperatures barely hit 20 degrees, and the wind made it feel more like 7 degrees during the ceremony. President George W. Bush, 2001: Temperatures were in the mid-30s, and there were rain showers. About 0.3 inches of rain fell during the day. That evening, there was light snow. President George W. Bush, 2005: Temperatures were in the mid-30s, with a mix of sun and clouds. About 1 inch of snow was on the ground following a previous storm, but the day was dry. President Barack Obama, 2009: Obama's first inauguration was frigid, with temperatures in the mid- to upper 20s and windchills in the mid-teens. Winds gusted as strong as 25 mph. President Barack Obama, 2013: Temperatures topped out in the mid-40s. Winds were 5 to 10 mph. For up-to-the-minute information on the forecast, follow the NBC Washington weather page.